In an exclusive interview, Yazidi leader Mirza Ismail discusses how the West has abandoned his people, who are on the verge of annihilation. Mirza Ismail, a Yazidi leader and chairperson of the Yazidi Human Rights International, says that the West claims to champion human rights and the freedom of all peoples, but in reality they are not living up to these principles. Ismail claims that the way the West has reacted to the Yazidi genocide proves this point. “The U.S., UK, France, Russia and China are the five permanent members of the UN Security Council. They claim responsibility for human rights and world affairs,” he notes. “They know that the Yazidi genocide took place in August 2014.
media documentation of Russian reports exposed that Saudi Arabia paid a ransom so that ISIS terrorists will be able to escape Mosul to Afghanistan via the Erbil airport in Kurdistan. According to the reports, the Kurds accepted the ransom in exchange for freeing some of their people. “Russian intelligence somehow found out the Saudi king and Turkish president met with [Iraqi Kurdish leader Masoud] Barzani and the three worked together to transfer ISIS terrorists from Iraq to Afghanistan,” he says. Furthermore, the Western media has exposed that Iraqi forces have discovered stockpiles of ISIS weapons that originated in Saudi Arabia and Turkey. Ismail implies that all of this proves that Saudi Arabia and the other Sunni Muslim countries are part of the problem rather than the solution. Yet, the West insists upon supporting countries like Saudi Arabia and Turkey instead of the minorities. “Recently, the U.S. said they will support the Kurds. No one is interested in helping the Yazidis,” he says. “What happened to the Jews, Yazidis, Christians and the other minorities?” Ismail asks rhetorically. “They used to live in Iraq thousands of years before the rise of Islam but now they are at the brink of a total annihilation. We are human beings. There is no difference between any types of human beings. Ismail claims that at the time, U.S. congressmen said in response to his appeal that the Kurds will offer the Yazidis protection, but as soon as ISIS arrived on Mount Sinjar, the Kurds fled the area and the Yazidis were left to their fate. “If the West put pressure on Saudi Arabia and the other Muslim countries, they could fix this problem,” Ismail says. “The world was silent when six million Jews were massacred. Same thing here. The Yazidis are screaming for international help. No one in the West gives them weapons to defend themselves against the Islamic terrorists. While they are saying that they are doing their best, they support Muslim extremists against us. So it is not easy. The ones implementing these atrocities today are ISIS; they used to be Al Qaeda. However, radical Islamists have been committing atrocities against non-Muslims since the seventh century, he says. “They killed non-Muslims for they consider them infidels. They believe minorities have no religion for they are not Muslim. In the Quran, they say the people of the book are Christians and Jews, but they consider them infidels nevertheless. The rest should be slaughtered or converted by force. Ismail says that when Saddam Hussein attacked the Kurds with chemical weapons, a no-fly zone was created for them almost immediately. However, he emphasizes that the Yazidis are facing genocide, yet the world barely mentions them. Nevertheless, he stresses that just because the world is neglecting the Yazidi issue does not mean the situation has gotten better. According to Ismail, the situation on the ground has actually gotten worse for the Yazidis. “Presently, we have thousands of refugees in Turkey, Syria, on European borders. They are screaming. Many of them have lost more than half of the family and decided they cannot go back to Iraq for they won’t be safe. “No country has created a program to save those people. I hear from Yazidis in Iraq and Syria. The international aid goes to KRG (Kurdish Regional Government) but it does not get to the Yazidis. 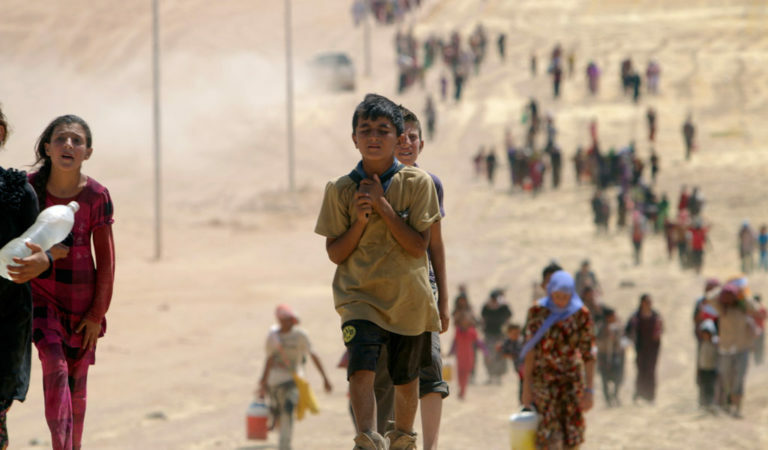 Canada says they give Iraq 300 million dollars for aid but that aid never gets to the Yazidis. In conclusion, Ismail says, “We are just human beings. God created us. If you are not happy with it, fight with God, not us. Only a power can give life to a human. Why don’t they respect God’s work? We can live together. “Sinjar is the home of the Assyrians and Yazidis for thousands of years. We have been fighting for an autonomous region. We don’t want independence. We just want an autonomous zone and to be protected by the people of the region. We can survive together in harmony. “It is against our faith to be against any faith. God created whoever he wants. It does not matter what your religion is. But if a religious ideology encourages you to kill innocent people, it is different.